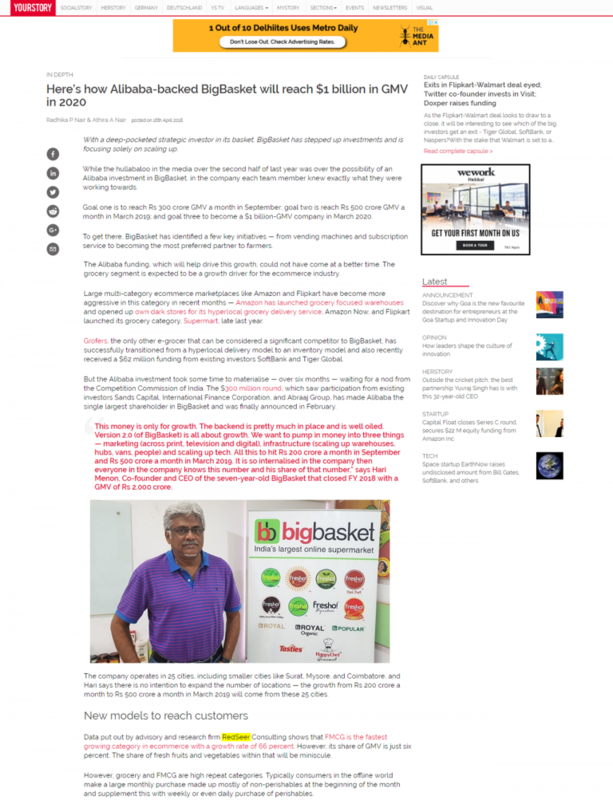 YOURSTORY: With a deep-pocketed strategic investor in its basket, BigBasket has stepped up investments and is focusing solely on scaling up. While the hullabaloo in the media over the second half of last year was over the possibility of an Alibaba investment in BigBasket, in the company each team member knew exactly what they were working towards. Goal one is to reach Rs 300 crore GMV a month in September; goal two is reach Rs 500 crore GMV a month in March 2019; and goal three to become a $1 billion-GMV company in March 2020. To get there, BigBasket has identified a few key initiatives — from vending machines and subscription service to becoming the most preferred partner to farmers. The Alibaba funding, which will help drive this growth, could not have come at a better time. The grocery segment is expected to be a growth driver for the ecommerce industry. Large multi-category ecommerce marketplaces like Amazon and Flipkart have become more aggressive in this category in recent months — Amazon has launched grocery focused warehousesand opened up own dark stores for its hyperlocal grocery delivery service, Amazon Now, and Flipkart launched its grocery category, Supermart, late last year. Grofers, the only other e-grocer that can be considered a significant competitor to BigBasket, has successfully transitioned from a hyperlocal delivery model to an inventory model and also recently received a $62 million funding from existing investors SoftBank and Tiger Global. But the Alibaba investment took some time to materialise — over six months — waiting for a nod from the Competition Commission of India. The $300 million round, which saw participation from existing investors Sands Capital, International Finance Corporation, and Abraaj Group, has made Alibaba the single largest shareholder in BigBasket and was finally announced in February. This money is only for growth. The backend is pretty much in place and is well oiled. Version 2.0 (of BigBasket) is all about growth. We want to pump in money into three things — marketing (across print, television and digital), infrastructure (scaling up warehouses, hubs, vans, people) and scaling up tech. All this to hit Rs 200 crore a month in September and Rs 500 crore a month in March 2019. It is so internalised in the company then everyone in the company knows this number and his share of that number,” says Hari Menon, Co-founder and CEO of the seven-year-old BigBasket that closed FY 2018 with a GMV of Rs 2,000 crore. The company operates in 25 cities, including smaller cities like Surat, Mysore, and Coimbatore, and Hari says there is no intention to expand the number of locations — the growth from Rs 200 crore a month to Rs 500 crore a month in March 2019 will come from these 25 cities. Data put out by advisory and research firm RedSeer Consulting shows that FMCG is the fastest growing category in ecommerce with a growth rate of 66 percent. However, its share of GMV is just six percent. The share of fresh fruits and vegetables within that will be miniscule. However, grocery and FMCG are high repeat categories. Typically consumers in the offline world make a large monthly purchase made up mostly of non-perishables at the beginning of the month and supplement this with weekly or even daily purchase of perishables.